Guest Blog: ‘Cannibalism In Archaeology Part 2: Mancos Canyon And Herxheim Case Studies’ by Kate Brown. Kate Brown is a current archaeological undergraduate student at the University of Sheffield. Her research interests include Osteology, Zooarchaeology, Mesoamerican archaeology, and Scandinavian archaeology alongside the general study of funerary rituals in human culture. Following my previous post on cannibalism in archaeology, I would like to discuss a few archaeological case studies in more detail. 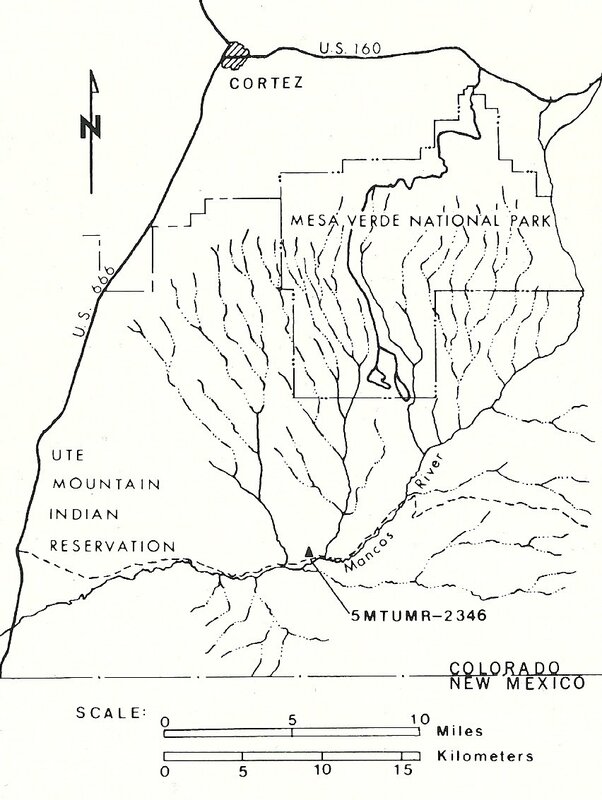 The Mancos site, of the Anasazi or Ancient Peublo Peoples culture, is located is located on Ute Mountain in Montezuma County, Colorado. The bone assemblage consisting of 2106 bone fragments was excavated in 1973 by Larry Nordby. Although the site is based on high ground, it is only 75m North East of the Mancos river, giving it access to both security and a reliable water source. Mancos 5MTUMR-2346 is held as a site of significant importance when referring to cannibalism, due to its excellent levels of preservation, owing to the lack of evidence for either pre or post depositional disturbance of the assemblage. This is imperative to reach such conclusions as it reduces the possibility of confusion in interpretations. Location of the Mancos 5MTUMR-2346 site (White 1992). In the 1973 excavations, a multi-room habitation was found, which had been built over the remains of an earlier dwelling. Primary interments (burials 1, 2, 4 and 12) were fairly typical, and were mostly contained within the rooms of the earliest structure. The rest of the skeletal remains were found in the room fill as well as on the floor surface, and because of this they were originally interpreted as either secondary or disturbed burials. The fragments in these ‘bone beds’ at the site could not be found to have any association or articulation, and individuals appear to be mixed together indiscriminately across the assemblage. There are many indications of possible cannibalistic consumption happening at the site. 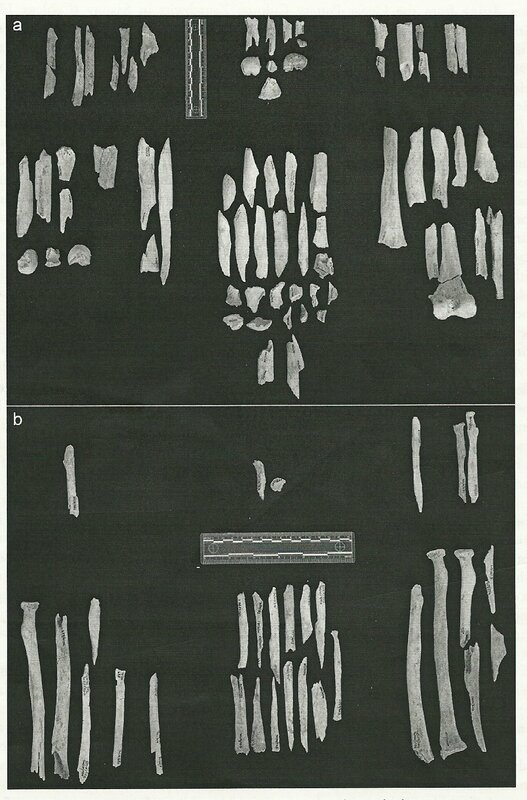 Thin long bones, most notably fibula, were found mainly intact, however, larger more robust bones, such as tibias and femurs were found highly fragmented; this points to impact being inflicted on the bones in order to reach the bone marrow, known as percussion. Percussion marks can be seen on many of the skeletal remains recovered. Breaks and fracture with subsequent polishing marks on the humerii (White 1992). Scratches on some skull fragments are likely indicative of scalping rather than attempts to crack open the skull as in other cases, due to the thickness of the skull in this case as a result of osteoporosis. The bones themselves were bleached quite light, and this is seen frequently in cases of cannibalism, as a result of being interred without any flesh adhering to the bones. Evidence of burning is evident on a large amount of remains, and because the pattern of burning on the bones is so varied it is possible to assume that they were heated whilst some flesh was still attached. 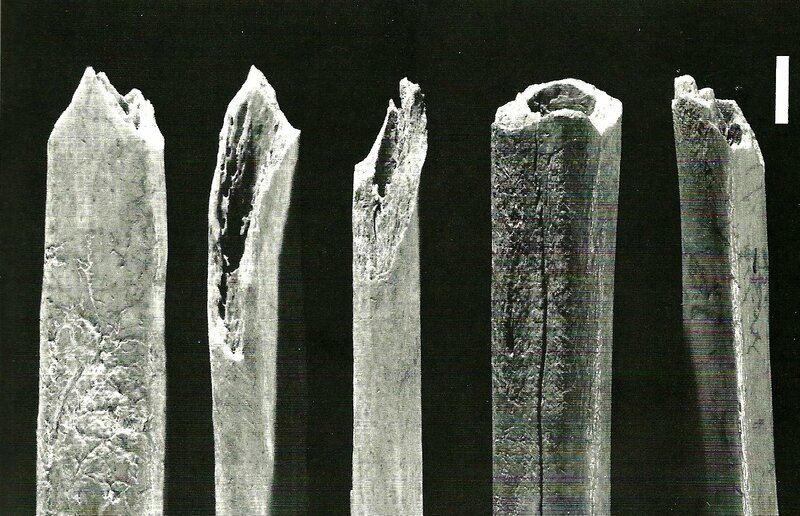 Pattern fracturing and fragmentation of long bone shafts in the assemblage are strongly evident of marrow extraction, which is common across cannibalism sites. 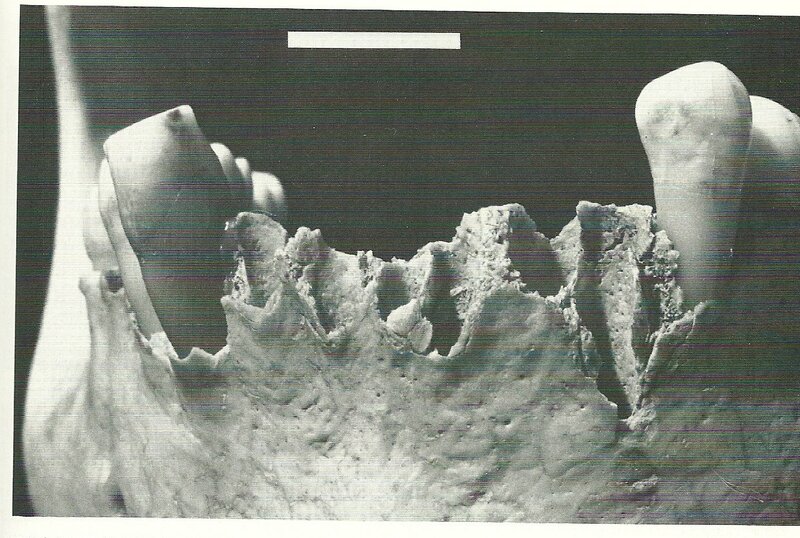 Crushing evident on anterior alveolar region of the mandible (White 1992). 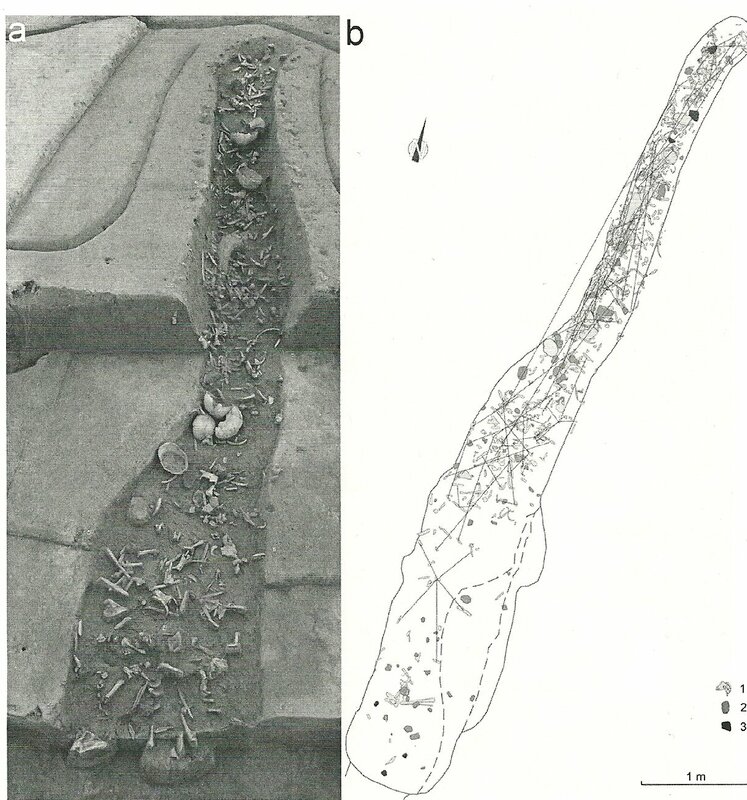 The evidence for cannibalism at the site of Mancos 5MTUMR-2346 is extensive, and includes high frequencies of most of the standardised factors for recognising such activity- the polishing of the ends of long bones as a result of cooking in coarse pottery, splintering and shaft breakage of long bones to facilitate marrow extraction; clear percussion scars, hammerstone abrasion, fracturing and crushing of bones; cutmarks indicating skin peeling and butchery; crushed skulls, chopmarks and peeling on lumbar vertebrae as well as a high frequency of rib breakage. 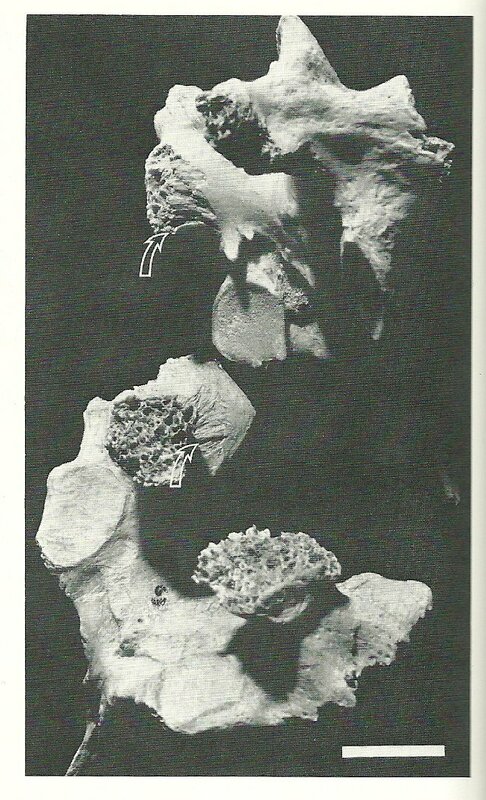 Peeling marks on thoracic vertebrae (White 1992). In terms of the pathology of the Mancos Canyon assemblages, it is quite typical of an Anasazi population. At Mancos MTUMR-2346 there are at least seven individuals with cranial deformation, and this is found to be present in all skeletal assemblages from Mancos Canyon. Cases of caries and abscessing are identifiable on two mandibles, and dental enamel hypoplasiawould appear to be quite prevalent throughout the population. This is also typical of Anasazi populations, who often suffered significant nutritional stress. Overall, the high number of young adult individuals far outweighs the instances of older individuals, which is unusual for a cemetery population. Nordby (1974) interpreted that the site of Mancos 5MTUMR-2346 was either attacked, with its inhabitants being killed, dismembered and consumed at the kill site, or that the inhabitants of Mancos 5MTUMR-2346 attacked a larger site elsewhere and brought dismembered bodies back to their own site for consumption. Located in the South of the German Federal State of Rhineland-Palinate, above a loess soil plateau, Herxheim is an early Neolithic Linearbandkeramic (LBK) site with compelling evidence for cannibalistic activity. Excavations have found evidence of a village that was inhabited between 5300 and 4950 BC. At the site there is a non-continuous (pseudo) ditch, which is rare in the Neolithic period, and is thought to have served as a symbolic boundary rather than as a physical defence. This is evidence of the sites importance, and demonstrative of a central position at a regional level. This could also serve as an explanation of the sites importance through to the final linear pottery period despite the change in function it underwent at this time. Location of Herxheim site (Boulestin et al. 2009). During the final linear pottery period, no new pits were dug, instead previously existing ones were re used to allow for the deposition of human remains, along with some fauna, ceramics, and tools made of both stone and bone. Scatters of bone fragments, some numbering up to 2000 fragments, have been recovered from these pits, and are representative of a minimum number of 500 individuals. However, with only half of the enclosure having being excavated at this point, it is hypothesised that there could be up to 1000 individuals within the entire area. In the assemblage, there is a notably high proportion of both skull fragments and leg bones compared to fragments from elsewhere in the skeletal system. Deposition occurred over a maximum of 50 years, but was probably a lot less than this. Deposit 9 at Herxheim (Boulestin et al. 2009). Deposit 9 was excavated in 2007, and contained a much higher density of human remains than anywhere else on site. 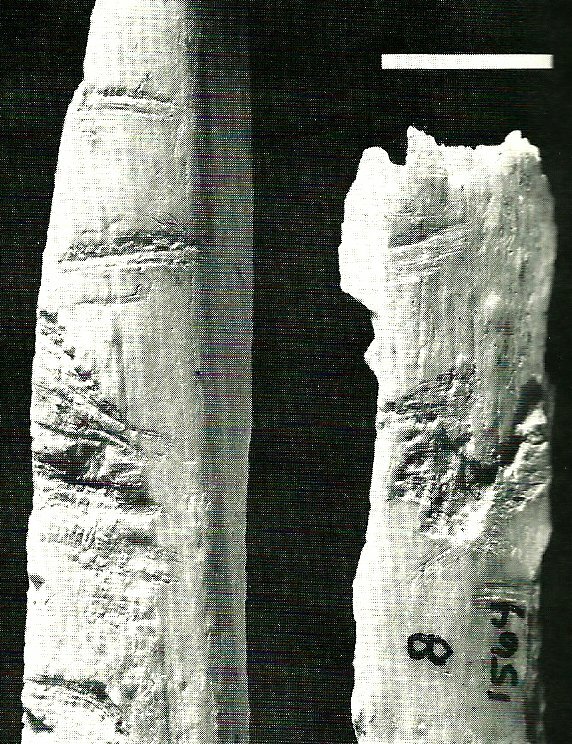 In the assemblage recovered from deposit 9, breakage was common, especially that of long limb bones. Short shallow cut marks are typically indicative of defleshing, which is common in cases of cannibalism. There is also evidence of butchery and skinning on fragments, shown by deeper varied cutmarks. Across the skull fragments found in the deposit, cracks and fracturing occurred often. Spongy bones were also often found to have been crushed, and peeling marks were frequently seen on both vertebrae and ribs, showing a butchery technique similar to that used in the butchery of animals to separate the ribs from the vertebral column. 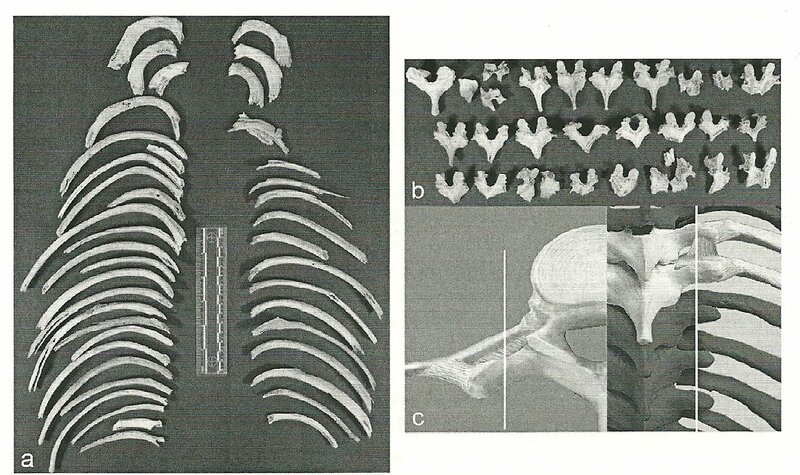 Rib breakage and peeling marks on vertebrae (Boulestin et al. 2009). As I have previously discussed in my last post, this is one of the standard indicators of cannibalism. Defleshing of long bones and marrow extraction are visible through scrape marks on the bones, and marrow cavities, and is another common manifestation of cannibalistic activity. Differential breakage of long bones can be observed, with bones housing larger volumes of marrow being far more likely to have been broken or fractured. This could be a result of the relative nutritional value to be gained from the differing bones. Finger bones were also preferentially broken, although foot bones seem to have been left more often intact. Example of differential breakage (Boulestin et al. 2009). Green bone breakage is another requisite for proof of cannibalism, and there is strong evidence of this taking place at Herxheim from the form of fragments as well as fracture outlines on bones. Skulls seem to have been the subject of particular attention, with many showing evidence of skinning following a repetitive method. In many cases, the tongue was removed, which is evident by cut and scrape marks on the lingual surface of the mandible. In some instances, the mandible was also removed from the skull following this. A distinct distribution of chew marks support the interpretation of cannibalism occurring at Herxheim; if the result of carnivore activity it would tend to have a much more random distribution across the remains than what is evident. However, because the cause of death is, at this point, undetermined, it is difficult to say whether this instance of cannibalism was a result of war, ritual activity, or a response to nutritional stress or starvation. Current interpretations view it to most likely be either a result of sacrificial ritual or revenge related to warfare, perhaps as an element of possible crisis at the end of the LBK period. This would also be supported by the evidence of increased violence at this time. 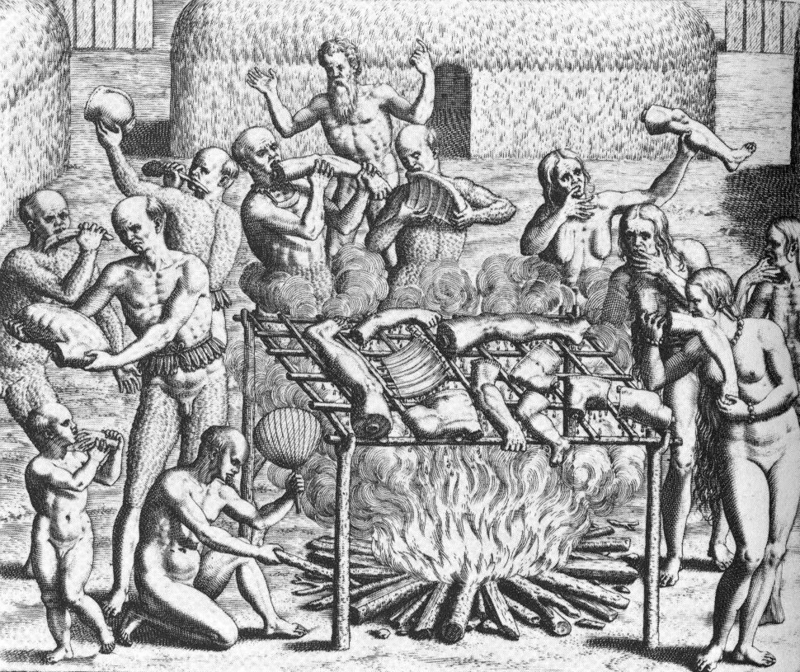 Instances of cannibalism in the Neolithic is often underestimated, largely because of the difficulties in recognising it following the current set of criteria, and in defending such interpretations, which are the subject of high amounts of controversy. However, these two sites, along with many more, have provided at least the possibility of cannibalism happening within past societies for varying reasons, and hopefully with more research, more stable interpretations can be reached and agreed upon. Boulestin, B., Zeeb-Lanz, A., Jeunesse, C., Haack, F., Arbogast, R., Denaire, A. 2009. Mass Cannibalism in the Linear Pottery Culture at Herxheim. Antiquity 83 (German language). Nordby, L.V. 1974. The excavation of sites 5MTUMR-2343, -2345 AND -2346, Mancos Canyon, Ute Mountain, Ute Homelands, Colorado. Bereau Indian Affairs, Contract MOOC14201337 Report. White, T.D. 1992. Prehistoric Cannibalism at Mancos 5MTUMR-2346. Princeton: University Press.